The beauty of my designs highlights all that is precious and valuable—our planet. In addition to the work of my caring and skilled hands, so much science and history went into the production of the colorful stones and metals we see before our eyes. I came up with the idea to use its Periodic Table representation as a logo because I find physics and chemistry fascinating. I knew that I really wanted to link this, via my logo, directly with what I do and who I am as a jewelery artist. I am also very awe-struck by our planet and its composition, its uniqueness and beauty—and its fragility. The Periodic Table is one of our many great equalizers on both micro and macro levels. As jewelers we are quite fortunate to have treasures such as silver, gold, copper, platinum, precious and semi-precious gemstones as our canvases for artistic works. The logo is a tribute to and talking point for the science behind our beautiful natural resources. I asked Tamra about her transition from physics to jewelry design. Growing up, I was heavily involved in creative play—sewing, writing, classical piano, making jewelry, etc. But, creative play was just that for me—play. It never occurred to me that I could pursue any of my creative activities as career options. My focus was always on what I thought to be the more “practical” route, so I originally went to college as a business major with the intent of eventually becoming a corporate attorney. Despite having laid out a course to go the “safe” route, by the time I graduated high school I was quite an accomplished pianist, and I still fantasized a lot about fashion design. It still didn’t occur to me to pursue either as a career! Majoring in business didn’t work out well, as I found the whole notion of conforming to traditional corporate culture totally unacceptable for me. So after my first year in college, I changed my major to physics. Well, what did I want to go and do that for? I didn’t like it when I was forced to learn it as part of my major because with all of the classes I was taking at the time, I never felt like I had the opportunity soak in what I was learning. As such, I grew to love physics only after I graduated and studied it on my own. However, all the while I still felt the pull of my creative and artistic sides. Long story shortened, after making and giving jewelry as Mother’s Day gifts one year, I got hooked. I became really fascinated with the many different ways in which jewelry could be made. I began with beading and wire wrapping, then I moved on to PMC clay, and from there metal fabrication. I feel so deeply in love with jewelry making and came to the conclusion that “this is it!” For the first time ever, it felt right, and it felt natural. A lot of jewelry fabrication involves chemistry, physics, geology, and the like. With an undergraduate degree in physics, not only were many of these concepts familiar to me, I found their expression through art to be a fun and initially unexpected way to maintain continuity between my past and current undertakings. What about jewelry design especially fascinates you? Three specific things actually: I love the variety of processes that can be used to make jewelry—the learning potential is endless, I love the fact that there is an unlimited number of materials available, and I love that there is so much science and history in the field. The three processes I find most fascinating are mokume gane, which is the ancient Japanese process of simultaneous diffusion bonding of several sheets of metal at one time, and those sheets are then rolled out and patterned to resemble a “wood grain”; granulation, which is the ancient Greek/Etruscan process of fusing tiny metal spheres to a metal backplate; and married metals, which is the process of combining different types of sheet metals (e.g., silver and copper) via soldering. I find all three of these processes and their histories fascinating. When done correctly, the results can be beautiful. Not to mention, each technique has its own challenges, and for me, I really love getting into the processes and solving issues to try to make things work to achieve beautiful results. You have said that you love running your own business–what do you find is the greatest challenge between making the pieces and handling the business of the business? Handling the business has always been the easy part for me. The business part comes quickly and naturally. With regard to the art-side, I’ve found that I am subject to my own whims and inspirations. It’s hard for me to sit down and make a piece for the sake of selling it. I don’t like the extent to which I sometimes have to coax out the creativity and art. When the creativity comes though, I’m usually pretty pleased with the results. I find my inspiration all over the place—I’m like a sponge in that regard. Many design ideas evolve from ones I’ve had before. However, when I’m doing work with what I call “art stones,” for example Wave Hill agate, the inspiration comes from the stone itself—the colors, patterns, shape of the stone, etc. Even then, spontaneity is subject to taking over and overriding my original design thoughts. Sometimes I try to plan around a particular theme to see where it takes me. I’m still trying to “find my voice.” As such, I’m not sure I’ve really yet developed a particular style. What I feel a strong affinity towards one minute changes with the discovery of another process or procedure—or with the evolution of an old design idea. Tamra’s passion and vision is so apparent that she seems destined to find continued success as she works to “find her voice”. 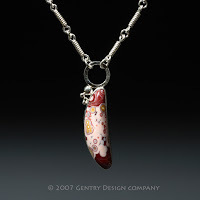 Her work can be seen on her website and through Esty. Galleries and shows are on her near horizon. I so enjoyed learning more about Tamra’s point of view, especially regarding the privilege of working with precious materials from our fragile and beautiful planet. I wish Tamra great success! Previous post: Karen Klinefelter: Minimal Magnificence! Next post: Naked-Jewelry Hits The Road!